The Charts below show the cumulative share of the vote each candidate acquires as the size of the precincts increase. This model clearly shows that as the size of the precinct increases Clinton and Rubio gain a larger share of the votes while Sanders, Trump and Cruz lose votes. This is NOT a random fluke, this is a consistent pattern with machine counted votes. While in OK, this trend was not enough to change who won the election, it may have had an impact on the number of delegates each received. eta2: I’ve updated the charts with labels for the Dem candidates and added Kasich to the Rep chart. The DNC has been doing everything it can to get the nomination for Clinton, so this isn’t surprising! As a Democrat supporting Secretary Clinton for President, I am not part of the ‘establishment’. I am not willing to cheat or stand by as my party cheats so the candidate I believe most capable of performing the job effectively and skillfully, gets the nomination. I do love Bernie is a strong challenger. My personal bias, as a woman she must work harder, be three times more qualified, more experienced than any man running for the office. The establishment has been gunning for her for years. After unrelenting, ruthless & brutal attacks, she has maintained her composure, patience, eloquence, used her intelligence & ability to go toe to toe w/the very establishment whose single purpose is to destroy her. So is CNN. Did anyone else notice they waited until 98% of the votes were counted to declare Sanders the winner in MI? If Clinton had been leading they would have called it at 50%. And before they called it, the conversation wasn’t about Sanders leading it was about Hitlery’s pollsters being so wrong. And to Beth, thanks for your post to Bernie. Good info and I hope he or his team sees this! But they waited for two days to call Missouri for Clinton so what are you talking about????? That race was too close to call. I want all votes to be verifiable in all states. Any honest leader at the state or Federal level would require that. I want all votes to be verifiable. A honest leader at State or Federal level would require that. Kathy, this is the most sane position I have read to date. I agree & thank you for stating it. Don’t worry about Bernie. Note that The Donald is also getting screwed as a result of the “anomalies.” He of the thin skin will not take it lying down; he will say it loud and clear that he is being robbed. Trump is just the character we need to get this scandal onto the front pages. Please get the data from a number of Trump primaries and send it to him with the same text you have sent to Bernie. Yes. After I wrote it, I thought about addressing it to both of them. Or including Cruz, who was only losing votes at half the rate of The Donald. But it was a bit too late for me to rewrite it at that point. I think there is no good reason to deny Beth Clarkson’s request for analysis. Let’s find out the root cause of the pattern that she has noted, and make sure that our vote counting process is honest. Well, personally, I think there’s an excellent and obvious reason to deny her request, at least from the standpoint of the Republicans: doing so will likely end their power grab, and eventually might land a few of them in jail. I didn’t say it was a LEGITIMATE reason, but from the standpoint of Kris Kobach, it’s pretty compelling. Are/will detailed results for Kansas be available to do this analysis? If so, it would be interesting to see if the trend holds for the human tabulated KS caucus results. My caucus in Topeka was long and pretty chaotic, but I’m pretty confident they got a good count of everyone there. I don’t know if the results will be available or not. Up to the democratic party to release them. In general, I have more faith in caucusing to produce accurate results. It undermines democracy when citizens believe their vote does not count. Recounts are essential to maintain the integrity of the process. I wonder what the GOP data from the Kansas primart will show. Beth, et al, what say you? Not a statistician here – just playing the devil’s advocate: could it be that voters in suburban and urban areas with larger precincts favor establishment candidates like Clinton and Rubio, whereas voters in more rural areas with smaller precincts favor Bernie and Trump. Or is this urban vs rural variable somehow controlled for in your analysis? If you can extrapolate and show that the bias you discovered holds also in larger urban areas that have SMALL precincts (if such a thing exists), compared to the same urban areas with LARGE precincts, then I guess that would settle the question I raise. I don’t know… I just hope we can get to the bottom of these things before it’s too late! Yes, that’s possible. Across the different places that use voting machines. But the probability is very low and combined with the fact that we do not (and are not allowed) verify election results, I think we should rate the probability of our voting system having been undermined as relatively high. In addition, add in the evidence that our Governor and much of the Republican ticket was very unpopular and expected to lose last election. I cannot say with certainly what the cause of these patterns are. I can only say they are there, they are indicative of vote rigging, and I cannot verify the outcome of our elections. A disturbing state of affairs IMO. Beth Clarkson did not use precinct size. She used votes cast in the respective primaries – there were different ordering for the two parties. If a county has a normative size for its precincts, then precincts which are more heavily Republican by registration and turnout, will be classified as large Republican precincts. This will also mean that precincts that are heavily Democratic, will be “small” Republican precincts. If a precinct is heavily Republican, then the residents will tend to be wealthier, better educated, more likely to be home owners, and more likely to be married. All these are related. Persons who had middle-income parents had a greater expectation that they would get a college education, and the means to pay for it. If they have a college education they will tend to have higher paying jobs. With higher income, they can choose a neighborhood with better schools, with homes that they can afford. Being and staying married makes the homes affordable. Having more income reduces stress on marriages. If someone has less education, they will likely have lower income, and not be able to afford as expensive a house. They may live in an area with more Democrats. There may be more stress on marriages. They may perceive immigrants as lower-wage competitors. In the higher income areas, immigrants may provide low-cost services. In the first neighborhood, voters will register with the Republican Party because it is the establishment party, and they consider themselves to be the establishment. They will be more likely to vote for establishment-favored candidates. And there will be more votes cast in the Republican primary. It will start out with more registered Republicans, who are more likely to vote. Republicans in other areas may not consider themselves to be part of the establishment. They may resent those who do live in leafier parts of town, even if they are Republicans. On the Democratic size, precincts with a concentration of black voters, will be extremely Democratic by registration. This will make them “large” precincts. Voters in these precincts don’t vote for Clinton because they live in “large precincts”, they vote for Clinton because they are black, which is also the reason for their precincts being “large”. Beth, could you please flesh out (preferably with data) to explain how this is not a result of demographics. i.e.– show a lack of differences in polling based off of precinct size? You state that it’s not the demographics, but it would be nice to have some data to back it up. Thanks! My district in Virginia used to have completely untraceable voting machines. Nobody liked them. Now they have been replaced with voting machines that create paper ballots to use for a recount. I make my choices and push the button. I hear it print the paper ballot. I hear the paper ballot fall into the box. I never get to see what got printed on my paper ballot. Somehow I don’t consider this a big improvement. Without recounts it’s no improvement at all. However, it does allow for recounts, so that is, itself something of an improvement. If J never sees what is on the ballot that is printed, then recounts are useless. The fraud could occur during the print. So the recount of printed paper ballots would match the reported count. A voter HAS to see and verify the printed ballot and then place it in the box. This wouldn’t eliminate fraud, but it could allow for potential recounting, assuming ballot integrity throughout process. I think we need redundancy, and user verification. And of course an open process from start to finish. Finally, during primaries, caucuses are conducted, ( well, at least in Iowa ) by the parties themselves, which are private corporations. I think they can pretty much cheat if they want to. This is why the Iowa Dem Party refused to release data on the .2% caucus win for Hillary. There is no legal basis for them to be transparent, it seems. I agree. Such a system is much better than the ones we use now in Kansas. Being able to have a recount is great but still relatively worthless if the paper that was printed in the voting booth was printed with information contrary to the voters choices. If the voter can not verify the information that was printed on the paper after casting their electronic vote before it was squirreled away for a possible future recount, how does anyone know with any certainty that it was printed accurately? The problem with technology is that it is no less prone to tampering than good, old-fashion paper ballots. I do think that there should be a paper ballot created by the voter and the paper ballot read by a machine or the voter should cast their electronic vote and a paper ballot should be generated by the machine. The paper ballot should then be verified by the voter and placed in a collection box prior to leaving the voting booth. This provides at least some basic items for the recount if necessary. Sadly, if someone is determined to skew the results of the election they will mange to do it one way or another. I think a person able to do it will have a position of influence and be of a mind to use their influence improperly. It won’t be the janitor or the secretary…of the polling place that is. Defense Secretary? That might be another story. You’re quite right. I personally favor those sorts of requirements. Is it possible to explain this anomaly as a split between rural and urban voter preference? If not, can you clearly explain why? I live in Oregon which operates with paper ballots mailed in. It’s a great system for both convenience and accountability. I have never understood the fetish for machines – and I’m a computer engineer. Maybe it’s because I know how easily machines are manipulated. In a close race, it only takes a State or 2 to flip an entire Presidential Election. And likely even more devastating is the effect on local, State and Congressional races. It is beyond tragic that the verifiability & integrity of our vote counts is so far from reality right now. This issue should be a priority for all within the US and beyond because US politics affect the entire world. No e-voting, e-scanning machines at all which are owned by the extreme right who have hidden/eliminated the real, physical evidence of publicly hand counted paper ballots. It should be self-evident what eliminating/hiding real evidence means, to aid and abet theft of elections to keep power among themselves which they could never win honestly. I love the idea of getting Bernie supporters and any other candidates’ supporters in the practice of auditing all states with primaries that produce a paper ballot but count it on a machine that is game-able on purpose. Caucuses have open head/hand counts which is real evidence, but even those counts need to be counted by several people for verification. I believe both political parties are corrupt and will do anything they can, to cheat, and to eliminate a honest vote, so they can put the person who they have bought and own in…. before a honest none bought off shill of the party. Beth Clarkson claims, “[t]his pattern is NOT due to random chance nor do voter demographics explain it”, but offers no evidence. A cursory examination shows that her claim is lacking in merit. (1) Sort the precincts by votes cast in the Republican Party. (2) Total the number of votes for each county, by candidate, party, and both parties. Sort the counties by total votes cast in both primaries (this is simply to get a measure of population, which can use as a measure of urbanization. (3) Divide the counties into classes. The 9 largest counties of Oklahoma, Tulsa. Cleveland, Canadian, Rogers, Wagoner, Comanche, Payne, and Creek contain 60.5% of the Republican vote. These counties encompass OKC and Tulsa and their suburbs, Norman(OU), Stillwater(OSU), and Lawton(Ft. Sill). Each of these 9 counties form a class. Next divide the remaining smaller counties into 5 classes, each encompassing about 8% of the vote. Class 1 is 5 counties containing the smaller cities of Shawnee, Bartlesville, Muskogee, Enid, and Chickasha. Class 2 is the next 6 counties; Class 3 is the next 8 counties, Class 4 is the next 14 counties; and Class 5 is the smallest 35 counties. (4) Calculate the Cruz, Trump, and Rubio shares of the vote for each class. In addition, calculate the average precinct based on Republican votes cast, both mean and median. And calculate the Republican share of the vote cast. (5) Now spend a little bit of time looking at the data. Rubio’s support varies more than that of Trump or Cruz. His support is particularly weak in the most rural counties, plus Comanche. Trump and Cruz support is slightly stronger in rural areas, but this is in part because Rubio’s support is so weak in these areas. Take the three smallest classes. Statewide 24.0% of the vote comes from these most rural areas. 28.6% of Democratic votes, but only 20.7% of Republican areas do. In Oklahoma, rural areas are more Democratic (or at least have higher Democratic registration). It was noteworthy when every county in the state had at least one Republican voter. On the other hand the cities, particularly Tulsa were Republican strongholds. While 20.7% of Republican votes were cast in these areas, only 15.6% of Rubio’s support did. Trump had 23.3% and Cruz 22.3%. Now let’s take a look at precinct size (Republican votes cast). The median for the state is 400 (half of Republican votes were cast in precincts with less than 400 votes, and half in precincts with more than 400 votes). That is, this is the precinct size for the median voter, not the median precinct size. The median Republican precinct for the three smallest classes was 189, 183, and 126, respectively. That is, precincts in the most rural areas are smaller. In addition, because the Republican party is weaker in rural areas, there are fewer votes cast in the Republican primary. That is the variation in voters per precinct is not as profound as the variation in Republican voters. Now imagine it was election night, and the votes were coming in, and they happened to be in order of votes cast. Imagine that they were paper ballots, and the election judges were equally facile at counting ballots (say 10 ballots per minute). 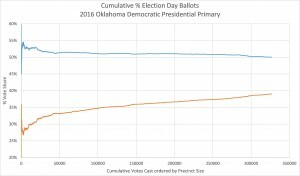 A precinct with 50 ballots would be counted in 5 minutes, one with 900 ballots would be counted in an hour-and-a half. It is 11.5 minutes after the polls closed, and the ballots have been counted in all precincts with fewer than 115 votes, and reported (this is 10% of the total vote). We have a population of 460,000 and a sample size of 46,000. We google for a MOE calculator and find we have a 95% probability of being within 0.43% (two standard deviations) of the actual final result. It turns out that Rubio ended up at 26.0% for an error of 7.3%, or roughly 34 standard deviations. What happened? Or it could be sampling bias. We have 10% of the statewide vote, but 46.5% of the vote from the most rural counties (Class 5) has been reported in. Over 20% of the vote has come in from Class 3 and Class 4 counties. About 10% of the vote from Class 2 and Comanche are in. Less than 1% is in from Rogers County. In effect, we have drastically oversampled rural counties where Rubio was weakest. You’re right that it could be vote fraud or it could be sampling bias. It might be demographic correlations. I can’t say what it is and more importantly what it is not! As I wrote Ned, I cannot say with certainly what the cause of these patterns are. I can only say they are there, they are indicative of vote rigging, and I cannot verify the outcome of our elections. A disturbing state of affairs IMO. Sedgwick County may be the only county in Kansas with a broad representative range of voters, and with both Republican and Democratic areas. Rural counties that are agricultural-based are heavily Republican. Wyandotte County is dominated by Kansas City, Kansas. Johnson County, is heavily suburban and Republican-leaning. Shawnee County is dominated by the capital. Douglas County by KU. There are four areas that can be considered Democratic – Wyandotte, Shawnee, and Douglas counties; and parts of Sedgwick County. Crawford County would have been at one time, but with the demise of mining less so (and has a small population). Shawnee and Wyandotte counties have small election precincts. When calculating the CVS on a statewide basis, the Democratic vote comes in earlier, and then you stop getting vote from these two counties. You have Douglas County trying to fend off votes from Johnson County, which is much larger, plus assorted other counties (Butler County has some very large, very Republican precincts, for example). The Republican and Democratic areas in Sedgwick County tend to balance each other. Within Sedgwick County, the Roberts share of the vote in 2014 was extremely correlated with Republican registration. You don’t need to look at the internals of voting machines to determine this. Party registration by precinct is readily available. In 2014, turnout was also correlated with Republican registration. This does not necessarily mean that Republicans are more likely to vote. It may mean that persons of higher income status are more likely to vote, and these persons are more likely to be Republican. Black turnout is less dependent on income status than that for whites. You will find higher turnout in city council district 1 than city council district 3. But city council districts 5 and 2 have the highest turnout, and the highest Republican support within Wichita. Precincts outside the city tend to have higher turnout, but this is also correlated with economic status. Now imagine you are calculating CVS by hand. You have a sheet with the results for each election precinct. You have a very long table, and you sort the sheets out by votes cast, with “larger precincts” to your right (as you face the table). If you use votes cast as your measure of precinct size, then you will place precincts with higher turnout further to the right, than if you had based it on voter registration. Similarly, precincts with lower turnout will be placed further left than they would otherwise have been. But because turnout is related to partisanship, you are also placing more-Republican precincts further to the right, and to the left if they are Democratic-leaning. But as you work your way down the table to the right, it becomes more and more dominated by Republican-dominated precincts. Now you get out your pencil and paper, and start at the extreme left end, with the smaller precincts. Sedgwick County does not have many rural areas. Even if most of the land is farmed, people can live in small towns, or farm houses, and commute into the city. So there is less of a Republican-buildup as the smaller precincts are added in. And then as you get past the medium-size precincts as measured by votes cast, more and more Republican-leaning precincts come in and push the Republican CVS vote share. CVS is an average measure. As precincts are larger, as measured by votes cast, they are not becoming more and more Republican, but rather there are fewer and fewer Democratic precincts being added in. The average does rise. Now I suppose it is possible that if you had a precinct with 2000 voters, 60% of whom were registered Republican, next to a precinct with 1000 voters, 60% of whom were registered Republican, that the Republicans in the larger precinct would be more likely to cross over, but nefarious election officials flipped them back. But isn’t it much more likely that adjacent precincts that are 60% registered Republican will vote the same way, regardless of the number of voters in the precinct? Have you ever plotted CVS curves based on partisan registration? Instead of using the number of Roberts votes compared to all votes cast, use the number of registered voters compared to all registered voters. When accumulating the precincts, order them based on votes cast in the 2014 election. Then generate the CVS curves for Roberts votes and Republican registration, but order the precincts by registered voters. What happens. What does a CVS vote curve for Shawnee County, KS look like? What about Wyandotte County, KS? Actually, yes, I have plotted the %Reg. Rep. curves and also run some multivariate regression analysis. Yes, There is a correlation between % Reg. Rep along with total votes cast and cumulative vote share (CVS). CVS is STILL statistically significant variable. I’ve written up some of those results for the paper I gave in Lawrence last month, but I don’t think they’ve published it yet. In the meantime, please feel free to share any results of that nature from your own analysis. As I have previous said, I could be completely mistaken about the pattern being due to election rigging. Although IMO, even if the machines turn out to be supremely accurate, it’s still reasonable to interpret the pattern as suspicious. An audit or recount can eliminate the machines as being suspect. But frankly, when the machines ARE suspect because they are not verified, I find correction of that issue of more concern. Hi Beth, I have deep concerns about the mysterious break in pattern with the Independent vote in OH. As we all know Independents were responsible for Bernie’s win in the Michigan “upset”. According to both campaigns Bernie was poised to win all three of the rust belt states but in the end that did not happen. As for OH the Independent voting bloc’s voting pattern was broken and caused HRC to carry the state. WITHOUT THE INDEPENDENT VOTES HILLARY WINS-AS SHE DID. Had the Independent vote remained, Bernie would have carried the state. Also, have you tried contacting the Sanders canpaign? I have a contact number for the Communications Director. I will post in a few seconds. I will have to retrieve the number. I will also share this as I am meeting more and more people who share the same concerns that this election is rigged for Clinton. Column A: Precinct used for 2014 election. Zero count precincts removed. Sedgwick County consolidated some precincts that shared ballot styles and voting centers. Columns B-F: Partisan registration data from spring 2015. Precincts have been consolidated to match 2014 election. Column G: Total registration at time of 2014 election (from election report). I have the 2014 partisan registration, but did not when I was developing the spreadsheet, but it is minimally different. Column H: Ballots cast in 2014. Columns I-M results for senate race. The difference between column H and M is undervotes and overvotes. Columns N-R results for gubernatorial race. This shows individual precincts, GOP registration percentage v. registered voters. It looks like a big cloud, but if you look carefully, there is a gap around 40%. A 50% GOP precinct is not a barely Republican precinct, because there are independent registrations – so it might be 50% GOP, 30% independent, 20% Democratic. It is critical to recognize that CVS curves are trying to consolidate data like this cloud into a curve. There is an extremely weak relationship between total registration and GOP%. It is best explained by sparser density of smaller (500-1200) GOP-leaning precincts, the concentration of extremely Democratic (<20% GOP precincts in the upper midrange (1400-2100), and their absence among the largest precincts. These precincts are predominately black precincts in north Wichita. Once they stop contributing to the CVS curve, the CVS curve rises. If you examine a CVS curve in a spreadsheet, you will find drops that correspond to a heavily Democratic precinct, followed by a gradual increase. These precincts are infrequent, but are extremely Democratic. This shows that there are structural reasons for a relationship between precinct size and GOP%. Precincts outside Wichita are somewhat smaller (say 500-1200) and because they are suburban, more Republican. They are limited to townships, and city wards, and irregular city boundaries. While the outer townships are mostly farmland, they are not truly rural. They are within commuting distance of Wichita, and 1000 people can easily fit within a few 100 acres. Some may be part-time farmers who don't need enough land to support a family, since they have other income. In Republican-leaning west Wichita there is a cluster of larger lime precincts (1750-1999) that are typically full sections. Towards downtown there are smaller precincts with fewer persons. These areas developed before widespread ownership of automobiles. Schools and churches and other possible polling places are closer together. In areas that were developed with ownership of an automobile assumed, schools and churches are likely to be further apart. A precinct that covers a full section, might not be as densely populated as a precinct that covers a quarter-section, but it is unlikely to have 1/4th density, and will have more voters. The largest precincts (yellow with 2000+ voters) are typically in outlying areas that have not developed to the extent to require division into smaller precincts. Since Sedgwick County employs voting centers for multiple precincts, there may be no need to divide these areas into precincts. There is no size cap in in Kansas law. While the structural causes of precinct size may be complex, that is not the same as their being random. And while the largest precincts may not be more Republican, there are few heavily Democratic precincts among them. I don’t understand why you are trying to convince me there are reasonable explanations for the CVS curves. I agree, there may be. But that doesn’t excuse the lack of transparency in our system for counting votes. That’s a problem whether you consider the non-random CVS curves for votes cast to be indicative of election rigging or not. This report was just regular by anonymous. I think analysis is in order. It’s only based on complaints that could be found via social media, still, what are the chances? Please pardon my repeated comments. Sometimes my comments do not posts at different sites, and after a time, I try again. Sometimes an election is determined be voters who normally vote but this time are so disgusted or dismayed that they stay home and don’t vote. The forfeit goes to the motivated extremes. I think it’s very important to address the electronic vote anomalies, and get to hand-counted paper ballots. I am trying to think of other ways to prove that the machine totals are being manipulated. Looking at MCM’s analysis of Massachusetts above, it is interesting to note that Sanders won handily in paper-ballot locations. This analysis should be applied to every state in the country. I was also thinking about a plot over time of voting totals as electronic machines were phased in…does the establishment vote jump up the year when the machines were used? I guess it would be hard to compare election to election. I think the idea of publicly funded exit polling is important. This is how other countries judge whether the total is manipulated. I was reading another stat person’s site, and there was interesting data when exit polls asked the person if they voted for in the last election. The totals didn’t match up. It also concerns me that there is a blackout in the media of stories regarding these anomalies.